It’s not always easy to financially plan for a major emergency, which is why so many people incur medical debt. And taking too long to pay that debt can have a big impact on your credit. Medical debt is a little trickier than regular debt, and for that reason, it has become an issue for consumers. Doctors, hospitals, and other medical facilities don’t report debt directly to the credit bureaus. Instead, they send unpaid debt to collection agencies, and these collection agencies report the debt themselves. Obviously, this can be an unpleasant surprise. But the good news is that this problematic process might be changing. Today, the law gives people with medical bills a lot more time to look over bills, negotiate with health-care providers, see what insurers will pay, or set up a payment program. It’s simply much more fair and friendly for consumers. 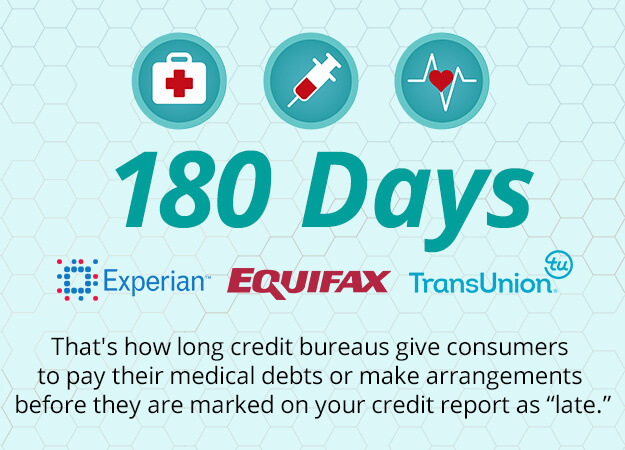 Last year, the three major credit bureaus–Experian, Equifax and TransUnion–also instituted a change that requires a 180-day waiting period before medical debt gets added to consumer credit reports. This is an important change, because medical billing companies have a habit of just sending bills directly to collections, sometimes even before consumers have a chance to review them. With the new rules, you’ll have about six months to make payments or make arrangements with your insurance carrier. If you’re having trouble making payments during that time, the best course of action is to talk to the creditor or collection agency directly. Most of them are willing to work out some kind of repayment schedule or medical bill assistance program. To learn more, here’s an important guide from Clearpoint that discusses how to negotiate medical debt. It’s easier than you might think. This particular change may not be much help to those who have already incurred debt. However, credit scoring firm FICO has created a new scoring model to address this problem, too. In other words, as long as your payments to the collections agency are on time, you should have the collections record totally removed. Second, the new FICO score differentiates between unpaid medical debt and unpaid non-medical debt. In short, FICO says unpaid medical debt should have less of an impact on your overall credit. If you can’t afford your bill, even after the six-month waiting period, you might try negotiating. Some consumers have luck haggling their medical bills with the original creditor or the collections agency. If you agree on a new amount, make sure to get the details in writing. O’Shea says that medical debts that are satisfied, whether they were settled or repaid, are disregarded by the new scoring model. This is much different than the reporting rules for non-medical debt that you settle. She adds that, overall, these changes are positive, but the system still isn’t perfect. For example, there’s no guarantee that the three major credit bureaus will use the new formula, and O’Shea says FICO 8 is more widespread. O’Shea adds: “A surprising number of consumers find surprises, such as an unpaid collections account, they knew nothing about.” As we’ve pointed out before, you can (and should) access a free copy of your credit report from each of the three bureaus every year through the FTC-backed website www.annualcreditreport.com. It’s always worth looking and double checking. I received a letter today from Medicredit about a medical bill. This is the first notice I received from the collecting agency. It has not appeared on my credit yet. Is there anyway to pay it before the collection agency reports it or is that probably already in the works. How do I resolve this with the CA even though I do not see it on my report yet? Hi Winnie! If you just got the notification, I’d suggest reaching out to them ASAP about the possibility of getting it sorted out ASAP! Thanks Emilie! What are your thoughts on me trying to contact the hospital instead. Would they be able to take payment or am I stuck with dealing with Medicredit from here on? And if so, do you have any methods of what I should rely to them to result in them setting up payment and not reporting on my credit. Hi Winnie! Great question. It certainly doesn’t hurt to try reaching out to the hospital, but if the bill has gone to collections or a third party, they may not be able to help you anymore. I have past medical bills that have been put on my husbands credit report. (The insurance is through his work and I don’t work at present) I live in Missouri which I thought was a separate property state. Does that even matter? And I am wondering what can i do if anything? Hi Maria! Really the best thing is to try to work out a payment plan if you can’t pay it off in full right now. Hope that helps! Hi Bella! I’m sorry you’re in this situation. I’m sure it’s frustrating. If you’re concerned about the legality of this, you should get in touch with your state’s local Bar Association to find a lawyer. I hope that helps! It’s all very sad. I had insurance that would have paid for a routine mammogram in full within network. My doctor wrote me out a script for a mammogram in a facility out of network. I did not inquire with them whether it was in network or not, of course they didn’t offer the info before I was ushered in for the test. Sent me a bill for 2,000. Should be illegal to charge without disclosing price beforehand. My ignorance for not asking and just assuming. Hi Enza! I’m very sorry that happened to you. Thanks for sharing your experience as a cautionary tale for others. Is the threshold 180 days from the date of service or 180 days from the date it is sent to the collection agency? Hello! That’s a great question! It is from the date of service! Hope that clarifies it! My fiance paid a debt that was help by a company called medicredit and he paid it in full. They refuse to delete and have it marked as paid in full which is not helping our worries woth purchasing a home. He has lost his FHA eligibility as a result. Do we have any way to get them to remove it? Hi Kristen! I assume you mean that the debt has not been removed from your credit report and is hurting your credit score, correct? If that is the case, I’d suggest considering a Credit Report Dispute. Can Medical agency report a claim from a bill six years after the service? Hi Dennis- Can you clarify your question: Do you mean reporting it on your credit report? I had a 5 bypass May 2016. My out of pocket was met, and I was at a preferred provider hospital. Everything went fine and all was covered; except the radiologist..They refused to accept my insurance and are charging me over $600.00. I refused to pay them, so they have sent me to collection November 2017. Ok I was fine with that, but now I have noticed that they have also added 10 $38.00 late fees to the collection account. Is that legal? I thought once it went to collections that was that. Every time I check, they add more fees. Hi Vernon! Sometimes those fees can be negotiated away! I hope that helps! I had a seizure and was taken to hospital about 2 years ago and my bill has been sent to collections and they have sent letters throughout the year that they reported to credit but anytime I check my credit there is no trace of it and my collections section is empty .. could this be an error on their part and I got lucky somehow ? After 2 years of them aggressively trying to get me to pay and numerous times of them reporting.. why isn’t it on my credit report ? Hi Kaytlen! I’m sorry this happened to you. There might be a reporting error somewhere keeping that bill from appearing on your credit report. I’d suggest working to get the account paid off as soon as possible so that it doesn’t surprise you later. Medical bill should not be part of a credit report. One does not elect to get sick whereas buying a car you are signing an agreement to pay x amount monthly. Same goes with credit cards. Insurance coverage varies greatly, and it is shameful here in KY where the average plan is at best 70% coverage after a deductible of anywhere from $3,500/5,000 PER PERSON. You get one simple surgery like gall bladder removal and you could end up with a $10,000 bill. Most folks do not have that in their back pocket and they did not elect to get sick. It is NOT fair that this goes on a credit report. It was not reportable in MA when I lived there and I was totally shocked when I moved to KY (a much lower income state) and learned it was reportable! So sad for many people. Sort of like a thumb squashing the little folks! I’m glad you’re making the best out of your tough situation Lynette! Thanks for sharing your experience! I had a major surgical procedure in Aug of 2014 and now I see on my credit report collection agencies that have posted these alleged debts well after the 6 month (180 day) time frame. What, if anything am I able to do as far as possibly removing some of these bills from my credit report that are past the 6 month (180 day) time frame? Hi Randy! These debts can’t show up until 180 days after the medical procedure. In that case, if the the procedure was in August 2014, it could only show up on your credit report in early 2015. If you received it in 2017, that is after the 180 day grace period. I suggest scheduling a FREE call with one of our credit counselors to come up with a plan to help you better your situation. I have a medical bill for my minor daughter that’s on my credit. It’s scheduled to “fall off” next year but I still have an issue. My insurance paid the hospital bill but I was not aware that there would be a separate “doctors” bill. Long story short, Credit Karma updates me on changes to my reports and this company keeps raising my medical debt at least 2 times a month! Can they do that? Literally twice a month now, they raise the debt. When will it end and what did I sign to agree to these terms? Seems pretty unfair. Any advice? Hello! I’m sorry. Likely, you’re incurring “late fees” or something similar. I’d suggest trying to settle with them ASAP. If insurance, all forms of it was banned, then prices would crash and be affordable. So I know some of these medical bills are over 10yrs old, I worked for a company who went bankrupt right before my 1st surgery and they didn’t pay our medical insurance. About 6 months later I received my first collection right after filling my bankruptcy in 2007, then a few years later I ended up in the hospital unexpected filed for the hospital’s bridge assistance to find out it was up to the doctor’s if they want to accept the bridge assistance to find out many months later I have to pay it, now 10yrs later I m getting garnished and I didn’t even receive anything to let me know this was what they were going to do. How can this be ok so many years later? Hi Shawna, Even though the debt is old, they may have been awarded a default judgment if you didn’t receive the court summons or failed to appear. At this point I would seek legal advice to see what your rights and options are. If you are not sure who to contact, you can get a referral from your local bar association, or legal aid if you are income qualified. I would check your state’s statute of limitations. It may be that the SOL has expired and you don’t have to pay that anwyway. Also, If the hospital/Dr. office sold the debt to the collection agency, you do not have a contract with them. The debt is with the hospital NOT the collection agency. I would demand the collection agency send you proof that you owe them the debt. For example, do they have your signature on file? I can guarantee they do not have it. If they do, it will be from the hospital/Dr. office and NOT from the coll. agency. These medical bills are serious and life changing. I went to a private hospital to have an MRI done in Bridgeport CT. They charged my insurance 10,000 dollars. I have never paid out of pocket since I pay a co-pay. Not until this hospital visit. They are billing me 4,000.00. I can not pay this much. I can only pay 500.00 and not a cent more. I will also need to pay that off. The private hospital mentality is frightening. I know everyone who is going through this wants to fight this. We need a way to unify and do this together. This feels like a social prank gone very bad. Let us find a way to fight this together. One pathology lab never sent me the medical bill. I directly received bill of $190 from collection agency. 180 days have not yet passed after the date of service. I came to know that credit bureau does not report in the credit history if the bill is paid within 180 days. Just want to know if I pay directly to the collection agency before 180 days period, will that be reported in the credit report. WHAT’A CROCK. THE COLLECTION AGENCY SIMPLY WAITS FOR 5 YEARS (WAY BEYOND THE 180 DAYS), THEN SLAMS IT ON YOUR CREDIT REPORT. BY THEN, YOU HAVE NO IDEA WHAT THE MEDICAL BILL IS FOR AND THE 3 BUREAUS COULDN’T BE MORE HAPPY. AND JUST TRY TO GET AN ITEMIZED STATEMENT FROM A HOSPITAL AFTER THEY HAVE GIVEN THE ACCOUNT TO A COLLECTION AGENCY. I agree I’m going through the same thing. I think it was a spider bit I was seen at an urgent care and payed them $80 to be seen. Now this year I somehow owe 1800 I never received a bill from them. Hi Amy! Your best bet is to pay in full and negotiate with them about how they report the bill on your credit report! After that, your score should bounce back quickly! Hospital reported me to credit bureau 3 years later for medical bills. Is there a time limit legally that the hospitals have to report to the credit bureau in a timely fashion and not put that on my credit barrel three years later from the time of service that that Bill derived from? thank you! I was looking at my credit report and for the last year I have had 100% on time payments to my new creditors that I have open accounts with trying to rebuild my credit with. I got into my credit karma account this morning to find a account that was bought out by company. They have had this account for awhile now and now they are showing that I have a late payment with them. I have never set up anything with them as far as scheduling a payment plan of any kind. how do I go about getting this off my credit or can I even do that?